They are flying squirrels, though Bob and I refer to them these days as "The Alien Air Force in the Attic." In a declaration of war, we have been in the process of eviction and exclusion of these costly pests. If that doesn't meet with the approval of PETA (People for the Ethical Treatment of Animals) and their views, too bad; we are animals too. If these were not the flying sort of squirrels, things might not have been as bad. While other squirrels are territorial and won't willingly share their nesting spots, the flying squirrels are all too sociable with their own kind. "Y'all drop by and stay awhile; we'll keep each other warm," seems to be their attitude, and their colonies expand amazingly. And that spells filthy, dirty, expensive trouble in the human habitat. The animals have inhabited our attic for quite some time, apparently, but we hadn't heard a sound from them, perhaps because our ceilings are high, our walls thick, and our insulation installed with exceptional R-factor ratings in mind. These construction details were designed to serve as buffers against sound as well, in this case to our detriment. OUR SAGA STARTED in earnest with the arrival of cold temperatures this season, when we realized our home just wasn't keeping us warm anymore. We thought perhaps our insulation had done some settling over the years and needed boosting. Like many people our age, we don't willingly climb into attics anymore, so we had an insulation contractor come to check things out for us. All too quickly he scurried down from the attic to inform breathlessly that he would return---"ONLY when those bug-eyed scary things are gone from your house!". We were fairly sure he wasn't referring to us, so my husband and a family member went into the upper reaches and were shocked at the damages there. We had a major project facing us, for sure. At least one price for the preliminary work---evicting the critters and sealing the access points the animals had established---ran into the thousands of dollars (close to $4,000), and that did NOT include the extensive bio-clean-up and the restorations. Our insurance company denied our damage claims; they had recently sent a policy amendment excluding payment for damages by rodents and removal of pollutants caused thereof. (Rodents!? In 15 years here, we'd never heard a rodent scratch or seen a dropping. So when that rodent damage exclusion notice arrived, we foolishly set it aside to discuss later with our agent). So here we've found ourselves as a result, acting as our own Homeland Security and financially responsible for the evictions and the barricading of our home against further invasion; and after that, the clean-up and replacement of the insulation. (You might carefully check your own insurance in that regard). We had set to work to beat the winter season, but the onset of cold temperatures arrived too quickly. Coupled with the drastic loss of attic insulation, winter brought new noises to our ears; we could hear the sound of furry little pilots "bowling!" (Actually, they were pounding acorns and black walnuts against the wood with their front incisors to obtain the inner foodstuff they had stored for winter). We since have learned that flying squirrels will also gnaw the bark from maple trees to get at the precious sap that so attracts them. And some occasionally will even fall into a sap-collection bucket and drown. (We're not mourning over that, except for the lost bucket of sap). IT SURPRISES MANY people that flying squirrels exist at all in this area, but wildlife people have said they're actually quite common, and more and more they seem to be creating problems in Lake-Geauga buildings. The reason you so rarely see these mammals---certainly not as often as you see the non-flying type---is because flying squirrels are the only truly nocturnal tree squirrels in North America.Their principal enemies include owls and house cats; in the case of our own problems with them now, you can add our names to that short list. (Forget the cat; I'm allergic). I know... Those flying squirrels are cute, especially if they're damaging someone else's house. And I admit I was once a fan of that celebrated TV jet-age aviation ace, Rocket ("Rocky") J. Squirrel of Rocky and Bullwinkle fame. But Rocky wasn't living in my house. If you don't take their "wingspread" into account, these little guys are no larger than chipmunks, and their plush fur, short ears, longish tail and bright bug-eyes give them an appealing, sprightly look. So appealing have they been to some, in fact, that southern flying squirrels (which inhabit the north too) have been captured or bred to be sold as pets since the 1800s. Via the internet, I'm even finding advice from flying-squirrel fans about adopting them; rehabbing them from injury; relocating them to someone else's property (likely illegal and certainly not fair); attracting them to your own property; building a home (nesting box) for them... HUH! They accomplish "flight" their own way---with legs outstretched and the fold of skin between each foreleg and hindleg acting as a combination parachute and sail (or glider wing), allowing the animal to turn or change its angle of descent. The tail acts as a stabilizer in flight (like the tail of a kite), and just before it lands, the squirrel drops its tail and lifts its forequarters to slacken the "wing," which then serves as an air brake. This highly efficient little self-contained glider-and-pilot contraption can travel at least three square miles in four hours, soaring from tree to tree. (It is usually the male who does this sort of travelling, by the way, to reach a female). INTERESTING AND CUTE or not, Bob and I have yanked the welcome mat from under our unexpected house guests. They haven't necessarily been leaving easily, and we've had our moments of frustration over that. One night, my husband climbed into the attic to check the traps and was confronted by a merry crew of flying squirrels, looking him boldly in the eye and gleefully dancing around among the traps, defying them... and him. Obviously, as my husband told me afterward, he was not invited to that party. I couldn't help laughing at the mental image of my burly husband being firmly banned from that gathering of bug-eyed, manic little critters. As of now, the war continues; we're progressing well and seem to be winning. But the season isn't over yet. (If you're not a flying squirrel intent on invading her home, Rose is always happy to receive your comments at randrmoore@gmail.com). (BLOGGER'S NOTE: I conducted this interview more than a decade ago, for my weekly column in Gazette Newspapers of Ohio. Now the Military Working Dog Memorial is approved and will open next year. A bill has also been approved for the care of retired military working dogs, for their care and adoption). HER NAME was Cali; she was a U.S. Army Scout. She was intelligent and beautiful, with thick dark hair, aristocratic form, and innate abilities that enabled her to save lives of fellow soldiers by searching out the traps and ambushes and other perils of war. Larry Buehner was Cali's partner in Vietnam, but all he has of her today are souvenirs and memories ... and the knowledge that the U.S. Army she had served abandoned her. "I didn't need to muzzle Cali, except on the aircraft," he recalls. "Cali was one of the few female scout dogs in my platoon ... She was really a good dog. Off duty she was playful and affectionate; on duty she was serious and focussed ... She was not aggressive ... She did nip a few guys slightly, but they were only officers." He grins. "That's what the guys all said to her, 'Well, that's okay; they were only officers.'" The war dog handlers were screened for an intuitive feeling for animals, and the ability to instill the bond that makes the dog and handler an effective unit. Buehner qualified by virtue of his history. "I always had a dog when I was a kid," he says. "I left a dog at home when I was drafted ... So there I was, a U. S. soldier in Vietnam, far away from home, and I had a dog; I had Cali! ... Most of the guys had dogs when they were kids, so they were always glad to see Cali. She was a comfort, a memento that reminded them of home. They'd talk to her, play with her ... But not when she was in her harness; that was working time for Cali; she ignored all else, and was strictly business." When a soldier trained with a dog, that dog became his friend, and that was true of Larry Buehner and Cali. He fed her, gave her water, scrubbed her, worked with her, relaxed with her ... Buehner wryly notes that as a draftee at Fort Benning, he volunteered for scout dog handler school, "because I was sure I had a better chance of coming back alive with those trained dogs." He laughs outright. "Only later did I learn, our dogs were so effective, the Viet Cong had bounties on them ... and on the handlers too." CALI AND HER HUMAN PARTNER were attached to the 37th Platoon, supporting the 2nd Brigade, 1st Cavalry Division Artillery at Phuoc Vinh, Vietnam. From platoon quarters at Bien Hoa, scout dog teams were sent out daily to the forward area at Phuoc Vinh. From there they were deployed to the 1st Cavalry units in the field. Larry Buehner thinks back to those days of "walking point" with Cali---dog and handler leading the way ahead of a combat formation. They were the "point men", dangerously vulnerable in the tactical formation, and statistics show these scout dog teams incurred the highest rate of casualties. It was not a picnic. Buehner considers himself luckier than some. "I never had to fire a rifle ... Still, it was a war on nerves, tense all the way." A handler had to constantly keep his eyes on his dog. The dog's reactions were a sort of code, a message to be read and relayed back to the platoon leader. "We commonly went into the field for three days at a time ... I walked Cali off the leash, working with a silent whistle. She walked 25 or 30 feet ahead, checking often to see that I was with her ... Once when we were walking point, she began alerting. I radioed back to the platoon leader, but he ordered us to keep on going ... I was surprised; had Cali been mistaken? .. Cali kept alerting, then one of the guys thought he heard slight movement out ahead ... Cali had saved us; we had almost walked into an accidental ambush by our own troops!" One patrol went on longer than expected, Buehner remembers. "Cali and I ran out of food. I called for a food drop ... Cali got her drop, but where was mine?" He chuckles. "I found out that Cali's Gainesburgers didn't taste too bad with water, but they were gritty." Each period in the field was followed by three days back at Bien Hoa "for a bit of rest. Then Cali and I would spend at least two days training together, to keep her interest and alertness at peak level, before recycling back into the field." Though Larry Buehner's daily contact with Cali ended when his Military Occupational Specialty was changed to combat photography, his bond with Cali wasn't broken. Buehner had a degree in fine arts, and photography seemed more in keeping with his education. But he found working with the dogs was "more selfsatisfying. A lot of us, even after we lost our jobs as handlers, would re-visit our dogs ... "
*Combat Tracker Teams who tracked enemy through scent or blood trails after contact had been broken. *Sentry Dog Teams who defended aircraft, airfields, supply depots, ammo dumps, defensive perimeters and other strategic military facilities; and often were deployed as the first line of defense at night. *Patrol Dog Teams who were deployed to patrol and protect air bases; to track, search buildings, and attack; and to ride with law enforcement. *Mine, Booby Trap and Tunnel Teams who were deployed with infantry and combat engineering units to detect mines and booby traps, and to search enemy tunnel complexes and Vietnamese communities for hidden arms, ammo and supplies. *Water Dog Teams who travelled with the Navy on patrol boats along the waterways, tracking scent of enemy divers underwater. By some estimates, Cali and her fellows in the K-9 Corps saved as many as 10,000 U. S. and Allied lives during Vietnam alone. They were unpaid, as far as money went; food, water, and the companionship of human soldiers was enough for them. Yet when the human U.S. soldiers left Vietnam, the dogs were left behind. WHEN THE 37TH PLATOON was dismantled, and the military didn't need as many dogs, thousands of the loyal canine soldiers were classified as "expendable equipment to be abandoned in place." "What happened to them ultimately isn't known to us," says Larry Buehner. "We tried with no success to get a bill proposed to get the dogs back home with us ... Dogs had gone home with their handlers from World War II and Korea, but not this time." "We sought respect and recognition for the dogs. We couldn't get agreement for a national memorial. We couldn't even get them on an honorary postage stamp (though there were 100,000 signatures). We lost out on that one to a cartoon rabbit---Bugs Bunny!" ANOTHER DOG-AND-HANDLER Team--the team of Burnam and Clipper--came to my attention during my efforts to track down a Northeast Ohio war dog handler for an interview. John Burnam of the Vietnam Dog Handlers Association (VDHA) is the man who steered me to Geauga's Larry Buehner. Burnam told me he and Buehner, armed with their memories, would be appearing in Lake County at Lake Farm Park.In that exposition of war dogs, guide dogs and police dogs, the war dog handlers would focus on the need for a national war dog memorial. A Virginia resident, John Burnam is a decorated veteran who served two tours of duty in Vietnam. He detailed his experience in the book, "Dog Tags of Courage: The Turmoil of War and the Rewards of Companionship". Lt. Gen. Harold K. Moore, USA retired, encouraged Burnam to write the book, and Burnam gifted me with a copy. The book is real and readable. It reflects the guilt and grief of all the handlers who saw their dogs abandoned. It also sheds some light on the handlers' steadiness of purpose in campaigning for a national memorial for the dogs. There is heartbreak in the narrative. Burnam writes with lingering horror of an enemy mortar attack on the scout dog kennels. The sleeping scout dogs were locked in for the night, and the handlers could only listen helplessly to the pain and panic of their dogs. Some dogs died; some were badly wounded; Burnam's scout dog Clipper was mid-kennel and survived.
" ... I viewed Clipper as a soldier, not equipment. He displayed uncompromising loyalty and obedience. His memory was magnificent. He knew what he'd been trained to do ... I got up early in the morning ... filled his water bucket with fresh water and cleaned his run for the last time, (and) afterwards I sat with him under his tree and stroked his head and back. ...I knew, as I sat under the tree, with my dog leaning against my leg, that I'd never see him again in this lifetime ... I tried to hold back my tears ... I looked into Clipper's eyes and gave him one last farewell bear-hug. Afterward I turned and walked away, with the bitter and sad knowledge that Vietnam would become my dog's final resting place. Clipper stood erect with ears pointed high like the champion he'd always been. 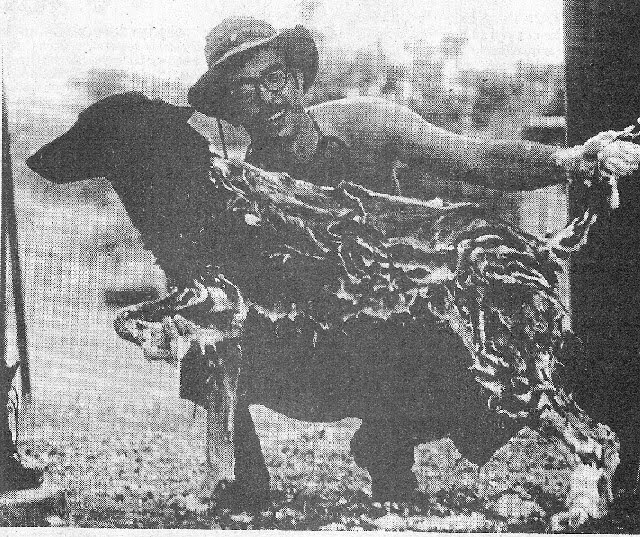 I sensed that he was watching me as I eventually vanished down the dirt road ... "
ATTACHED PHOTO: Bath day in Vietnam for Army Scout Larry Buehner and his k9 partner Cali.